Just so my readers (well, eventual readers) will know what we do, I thought I would start with a few pictures of projects. 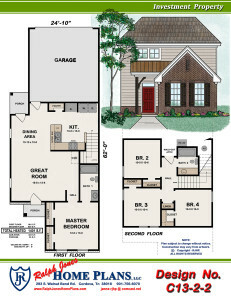 Our home plans start at about 400 sq. ft., although with the new Tiny House Movement, well, to tell you what I think about that, I’m obsessed! But haven’t published any of those … yet. Here is a recent design I did. Before you tell me how terrible the kitchen and bathrooms are, this was designed to be built BY Property Investors with the specific goal of renting this house out right off the bat. Therefore, I was given a specific list of criteria. 1. MINIMAL Bathroom Cabinetry – they tried to talk me into a 24″ – 30″ vanity, but I refused to use anything less than 36″. Granted a 36″ vanity really isn’t much if you need a little space, but it has that precious extra 6″ to hold at least a curling iron… for the girls. 2. MINIMAL Kitchen Cabinetry – the investors also did not want many kitchen cabinets because they often get destroyed by renters. The fewer cabinets, the better as far as replacements. Because I have a heart for renters (I was once a renter), I TRIED to give you more cabinets, but was shot down, so, I made a big pantry that will hopefully allow you to forgive me for the lack of cabinets. 3. Four Bedrooms, Two Bathrooms, 1350-1450 sq. ft. There were a few other criteria, like the overall width and depth of the house and of course there were some restrictions regarding the lot size, so the physical footprint trumped some of the above criteria. If you were buying this property, particularly in this area of the country, this would definitely not be a great choice, yea there are lots of bedrooms and 2 full baths AND a garage, but the cabinets aren’t ideal especially for a homeowner. 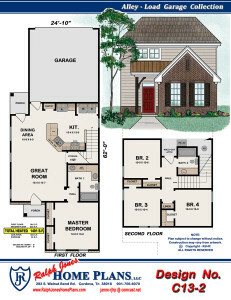 However, if this size house is what you are looking for, maybe the “normal version” of this plan would be more appealing. Notice the expanded bathroom on the first floor, the additional storage room under the stairs, the added cabinets in the kitchen as well, there are doors which close off the washer/dryer (in the plan at the beginning of this post, those are open to the world… not my choice, but to save money for the investors). Yes, this is a rear loaded garage for use with an alley style subdivision, but we also flipped it over for a front loaded garage where the Master bedroom is on the back of the house. Works great either way. 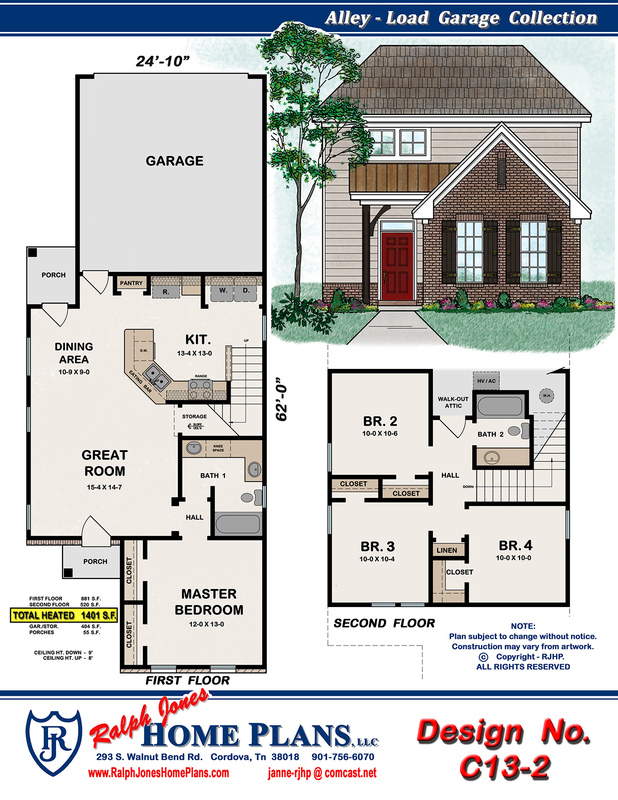 In either version of this plan, you could add a bonus room or even a 5th bedroom with minor modifications and that room could be added above the garage. By the way: I’m told that this house was rented out PRIOR to it being completed for about $1300 per month. This is pretty good in our market. Nice 4-bedroom/2 bath homes are apparently hard to come by around here… well, located in good neighborhoods. Your thoughts and comments appreciated. If you are a property investor and build new homes for rent, what criteria would you ask for? As always you are the best and smart and beautiful, you are correct, kitchen and baths sell houses. This floor plan typically fits the investor the best. They are correct renters do tend to “beat up” a house. Also, currently our rental market is still low especially for 4 bedrooms. Not to mention, if they do a Section 8 housing the rents are higher for the 4 bedrooms. However, should the investor want to sell, they limit the market to other investors and depending on what tax changes, market changes, etc. are going on at the time puts them on some “skinny limbs”. Love the blog, great idea. I think we need lunch to discuss. Miss you. Allyson, you are absolutely right. All this time (50 years) we have been designing homes for the OWNER, not the renter/investor. Investors want a whole different house. They do NOT want closets everywhere, they do not want anything special, in most cases they don’t want any doors to cover stuff up (such as the laundry machines). This was a whole new game for me when an investor came to me with the scenario. I am happy to design the house with those specifics, BUT, like you, I think if they want to sell them in the future, they will probably end up selling them to OTHER investors, rather than to a potential homeowner. I would only live in one of these if I needed a place to crash for a little while while I was waiting on the REAL house. I do think, however, it hits a demographic that is currently not being hit, but I think there are plenty of 4-bedroom houses in Memphis, but probably not in desirable neighborhoods. You can get some really big square footage and awesome yards, but with that also may come crime and punishment too. (if you know what I mean). Thanks for your great remarks. Excellent, wonderful items gentleman. Now i’m an avid fans. Keep writing. Thanks, Canada Goose! Welcome aboard! We are sincerely working very hard to revamp our website, we expect it to be finished from our webmaster in a few weeks so that we can populate it with new (and old) inventory in the realm of home plans. We have had our plans brokered through other websites and magazines in the past but decided to put our collection out as a unit. 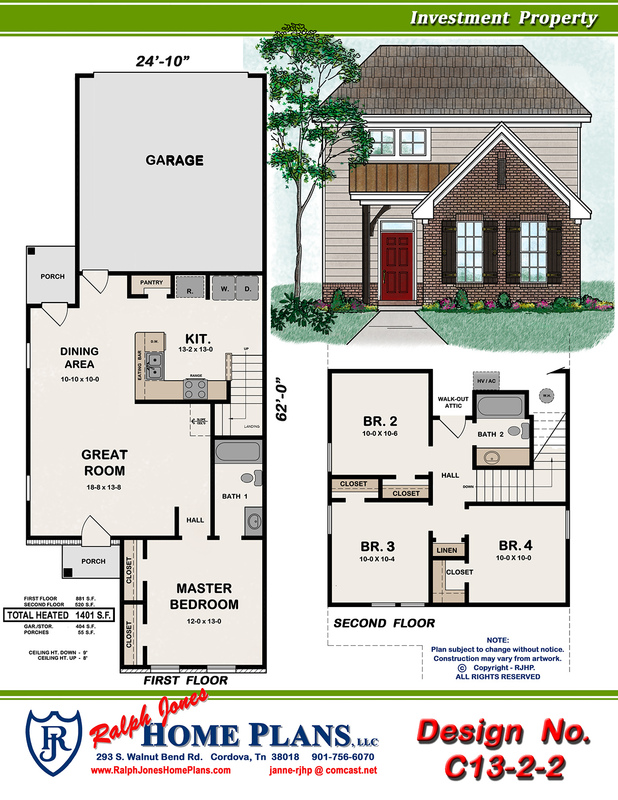 Since it is not quite ready at the moment why don’t you tell us the things you like in home plans and we will try posting things that may appeal to you. As we get our website going, as well as this blog which is also new, we hope to answer the questions that often come up with clients about building a house. So feel free to ask questions. The questions you may have will also certainly be asked by others so eventually this blog will cover those things more fully. Above all, thanks for visiting and please come again.